The Christmas (holy day) holidays are here and kids are beaming with joy. 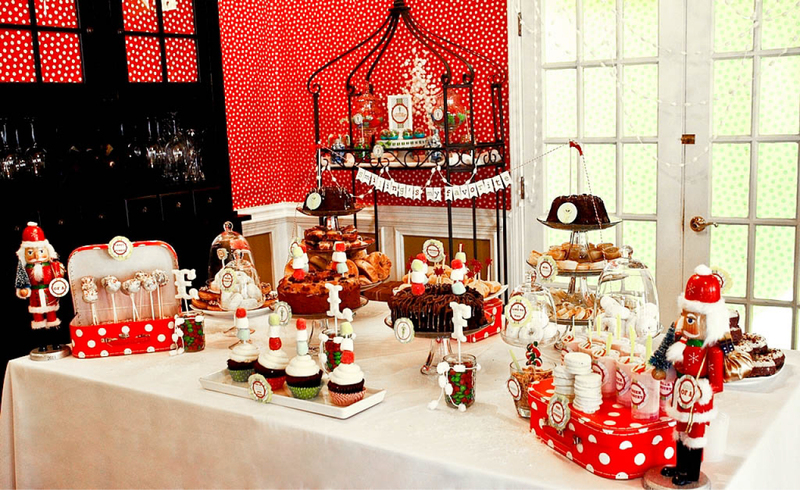 Let’s take a look at the 36 best Christmas dessert table ideas that will add cheer and fun to your dessert tables, making the kiddos and young at heart alike jump with happiness! Yes, Christmas is a merrymaking time for all, especially the young ones who look forward to celebrating it with such gusto. 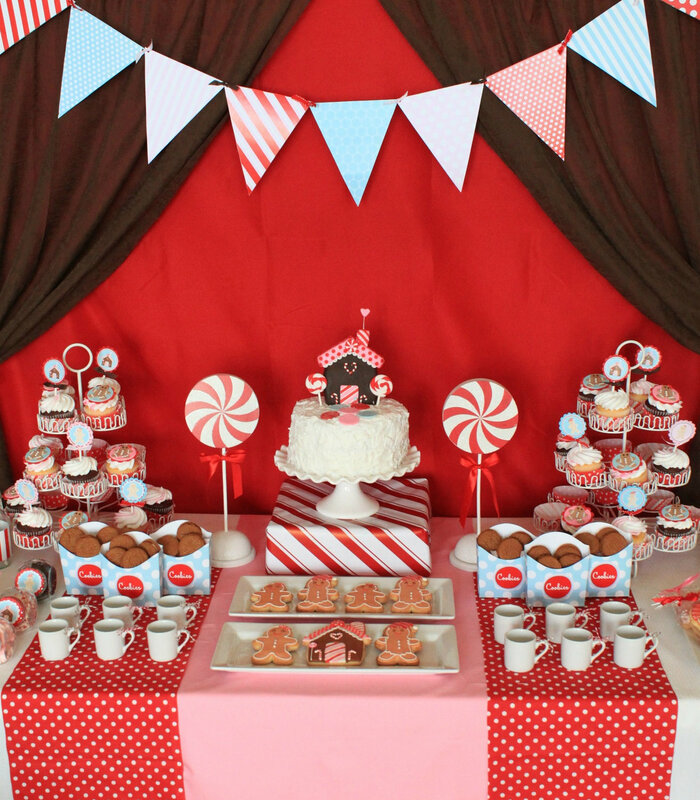 What better way to cheer them up than to decorate the dessert table in a new way? 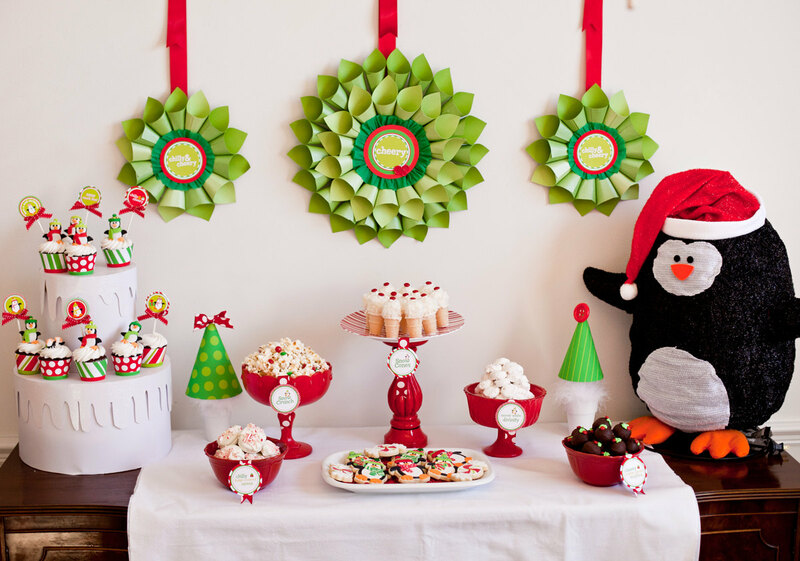 With these amazingly creative kids’ table ideas, your dessert tables will shine bright and become a major focal point of your Christmas party. The thought of a candy cane with its swirly design and smooth texture brings back so many sweet childhood memories. 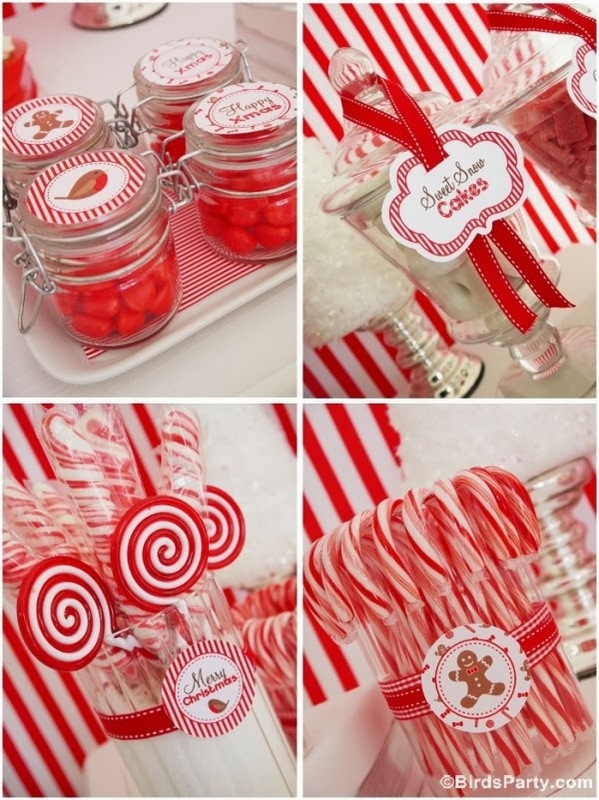 Now you can give the same sweet experience to your kids by decorating their Christmas dessert tables with cute and colorful candy canes. 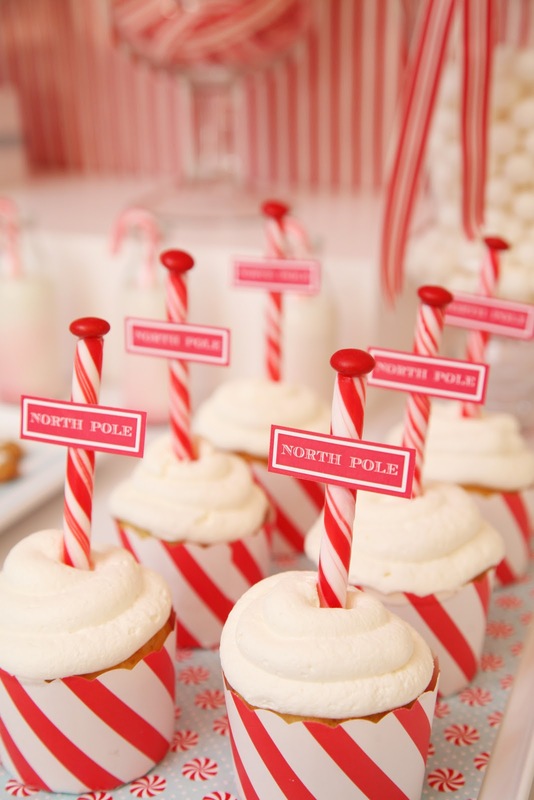 From giant candy cane lollipops tucked inside puddings to candy cane-colored cups, mugs, or runners, there are many different ways you can adorn your Christmas dessert table with this theme. 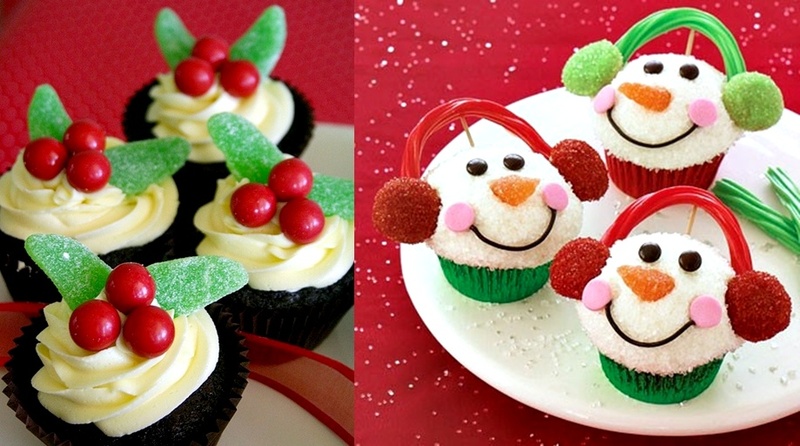 If you have a cupcake stand, try decorating it with candy cane straws to add color. 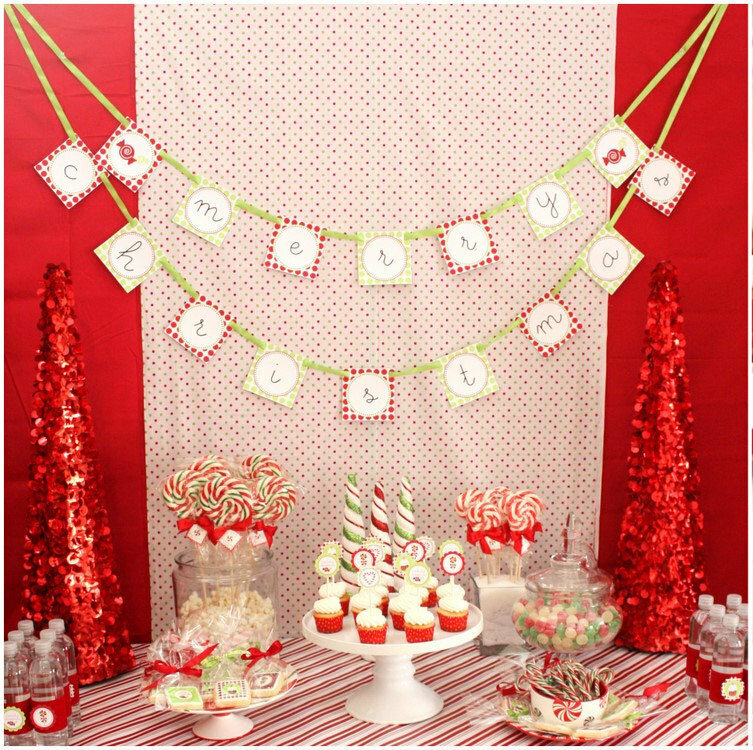 Even the backdrop can be decorated with paper candy cane crafts. Christmas and nutcrackers go hand in hand with the wooden carved soldiers or kings being used on Christmas tables since the 15th century. These wooden toys serve as beautiful decorations on a dessert table, and kids simply love the colorfully attired figurines of knights and soldiers. They stand for courage and are seen as guardians. 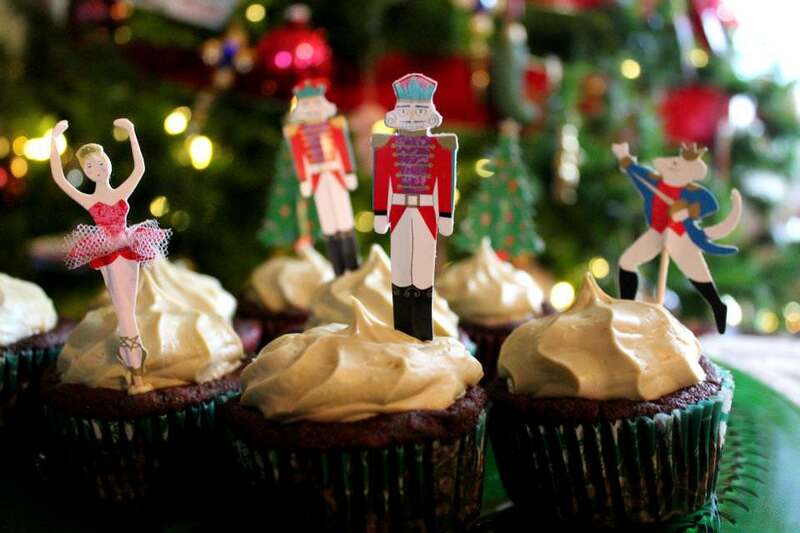 You can have an entire dessert table dedicated to the nutcracker theme or keep a portion of it reserved for these princely soldiers. The Christmas table décor seen in the images below feature colorful soldiers and kings in green and red tones, placed here and there. If you don’t want to collect the figures, you can print out paper cutouts and use them as cupcake or cake toppers. Almost every child loves the story of the runaway gingerbread man, and making gingerbread houses are always a fun and tasty activity. You can make one with your children, let them each make their own, or simply decorate with gingerbread cookies, cakes, and other sweets with the gingerbread man theme. Frosty the Snowman is one mascot that’s closely associated with a wintry Christmas and children all over enjoy making their own snowmen. 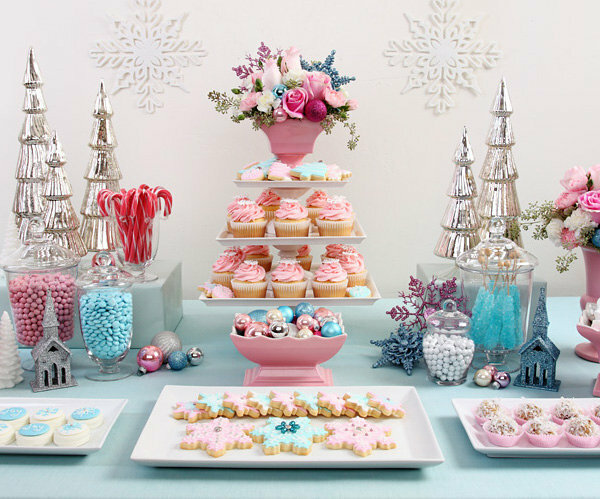 Why not adorn their dessert tables with cute snowmen placed either on top of the cake, in cookie shapes, as marshmallow and candy creations? 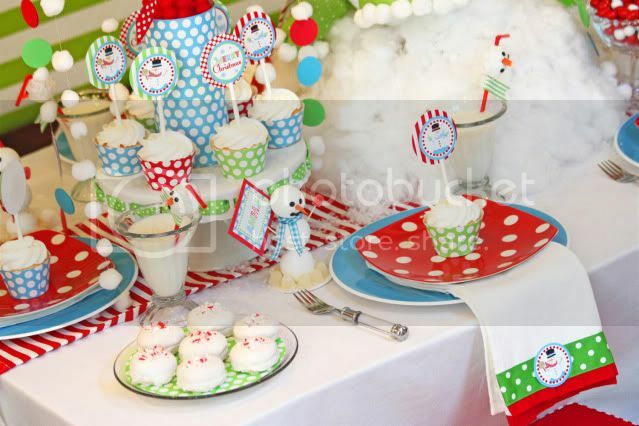 There are plenty of ways to enhance your kids’ dessert table décor using the snowman theme. 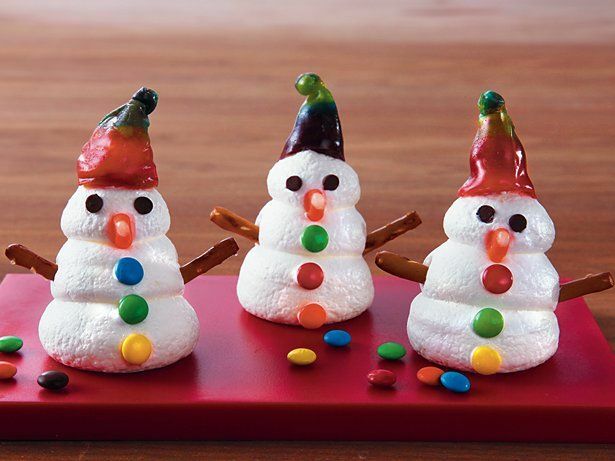 From cute snowmen meringues arranged on a tray to making your own foam ball snowman centerpiece, the ideas stop with at the limits of your creativity! Which kid on earth doesn’t like cupcakes? They’re cake. They’re portable. They’re pre-portioned and pre-decorated so you can use them as decorative pieces until it’s time to eat them. Use them to add fun to the table setting and as an easy dessert after the meal! 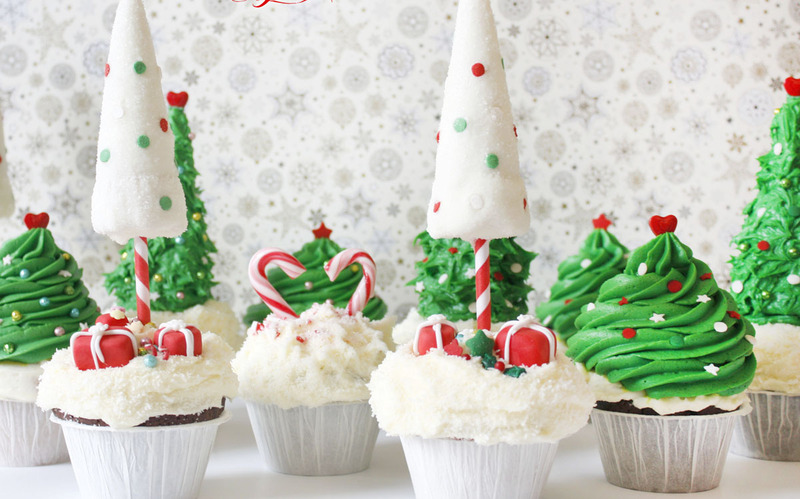 From green and white Christmas cupcake décor to having Christmas cupcake stands, you can use these sweet treats to bring smiles young and old faces alike. Polka dots add a sense of whimsy to outfits and table décor. 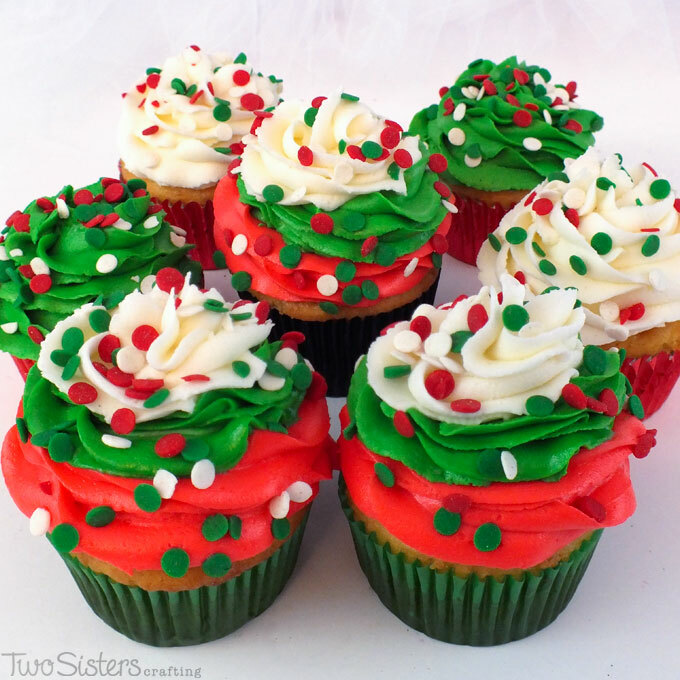 Polka dots in red, green, white, or frosty blue spread cheer with their mere appearance. 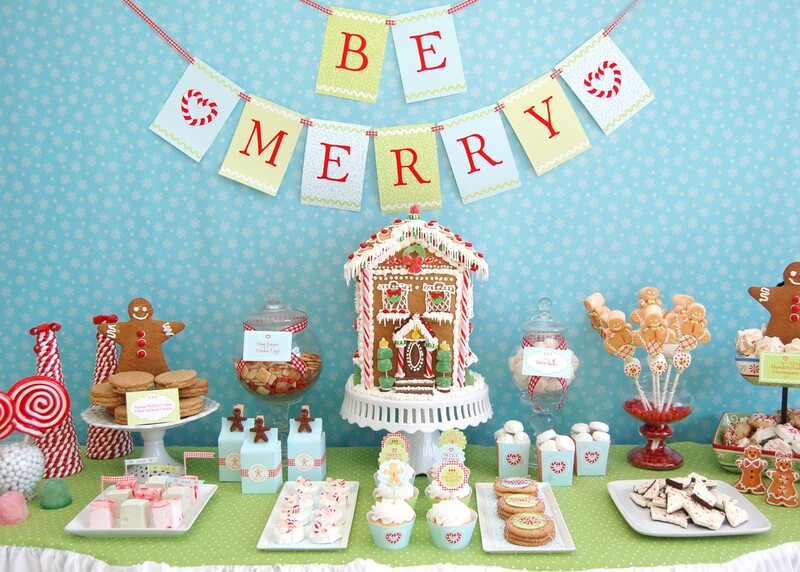 From polka dotted table runners to cups and plates, they will make Christmas dessert tables now look festive and sparkly. Use them with a snowflake theme to complement the season! 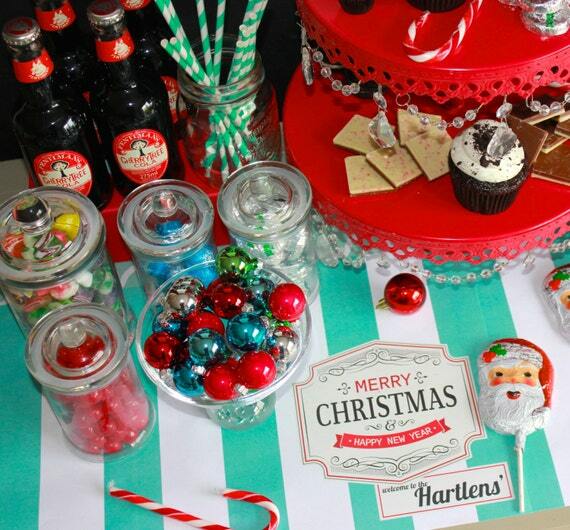 Try this theme with older girls as vintage Christmas dessert tables look classier for a more mature crowd. Use sweet tones of blue, yellow, pink, silver, and other pastels to decorate the table and desserts. From pink cupcakes to light blue cookies to pastel floral arrangements, the vintage theme can be added to any part of the table décor. Even the choice of candies can have a vintage feel. Red and white look great by themselves. Leaving green out of the scheme provides a softer, more elegant feel to the table that is still bright and festive. 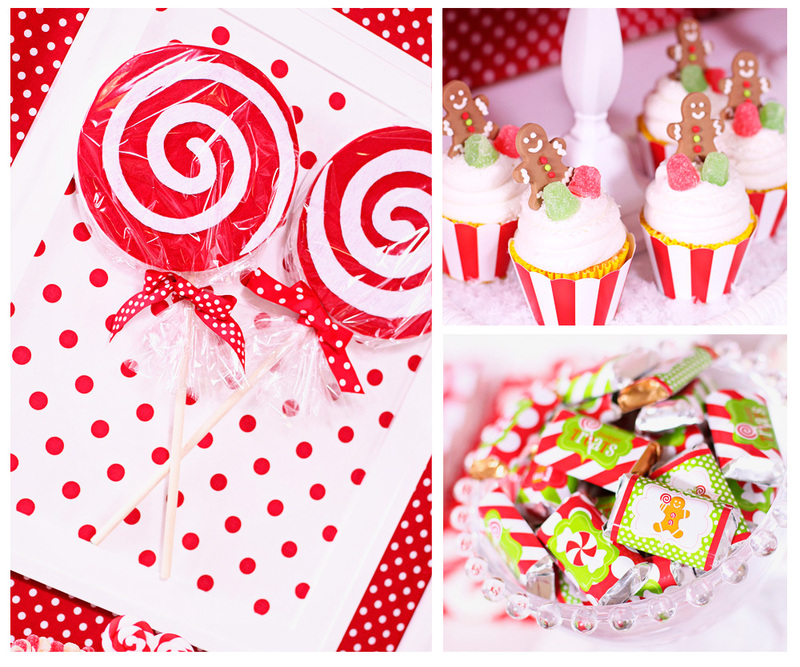 From having red and white swirly straws to lollipops to runners to chocolate spreads to puddings and ‘cherried’ chocolate balls, red and white can be added to anything. Add a little more charm and personalization by letting your children help with the decorating. Or else finish projects yourself with a little less polish. You can try adorning your kid’s dessert tables with colorful ice cream cones embellished with icing and candy, or cut out paper cones to hold candy and other treats. Your Christmas tree centerpieces can be inexpertly covered with candy sequins or any other material you choose as the faux ornaments. 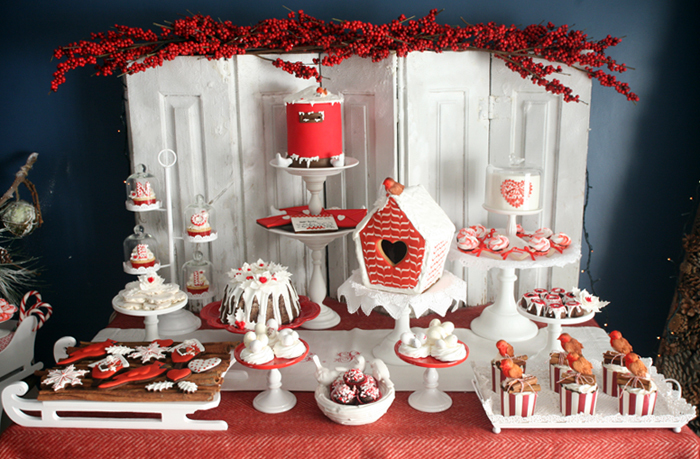 Any winter or Christmas theme will work well for a kids’ dessert table. From Santa to Rudolf to Frozen to Narnia to the Nightmare Before Christmas, you can tailor the table according to your child’s interests. 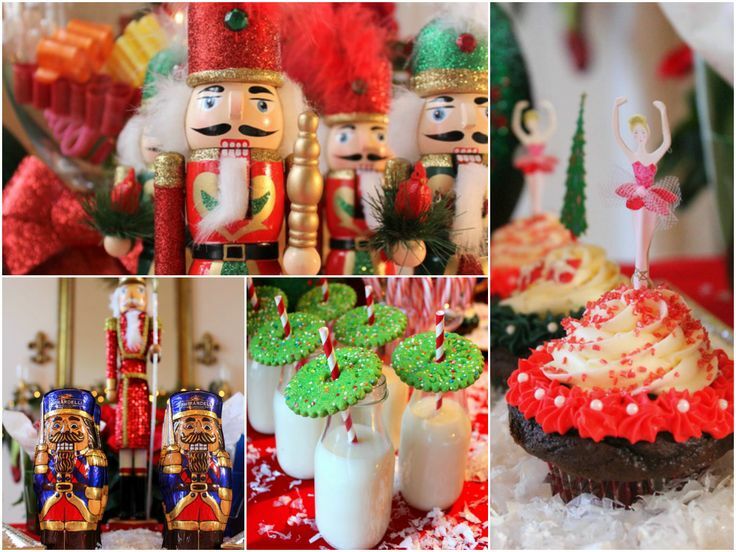 Have these 36 kids’ Christmas dessert table ideas provided you with enough inspiration to get started? Browse back through the list and take notes on how you might apply these ideas to your theme!